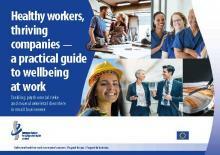 The new “Healthy workers, thriving companies - a practical guide to wellbeing at work - Tackling psychosocial risks and musculoskeletal disorders in small businesses” provides simple explanations and features a selection of exercises that can be used to create meaningful and lasting improvements, for the benefit of workers and businesses. To download the guide go to EU-OSHA publications. In a new report, EU-OSHA publishes the findings of a major 2-year project to anticipate the effects of digitalisation on occupational safety and health (OSH) in the EU. According to the Foresight on new and emerging occupational safety and health risks associated with digitalisation by 2025 report, psychosocial and organisational factors are likely to become more important as digitalised working drives changes such as increased workers monitoring, an assumption of 24/7 availability, more frequent job changes and the management of work and workers by algorithms. All this can raise levels of workers’ stress. Increased ergonomic risks, caused by human-machine interfaces and the growth in online, mobile working, and heightened cyber-security risks are also identified as likely outcomes of augmented digitalisation in the workplace. the pace of work; how, where and when it is done; and how it is managed and overseen. To download the report go to EU-OSHA publications.